Alzheimer's, Parkinson's, Multiple Sclerosis, Kidney Stone Prevention - A Vitamin?! The US Patent Office had issued several patents on the use of IP6 for treatment of Alzheimer's disease, Multiple Sclerosis and Parkinson's Disease. Work at Dr Manju Reddy's Lab in USA show "significant neuroprotective effect" of IP6 in a cell culture model of Parkinson's disease. Professor Grases in Spain proposed that a deficiency of IP6 could be a risk factor for Alzheimer's disease and exactly a year later in January 2011, a paper published in the the Journal of Alzheimer's Disease demonstrate the usefulness of IP6 in its treatment in experimental models; "...[IP6] may provide a viable treatment option for AD [Alzheimer's disease]"conclude the authors.. Professor JoAnne McLaurin and her colleagues at the University of Toronto have shown that inositol can bind with the amyloid β protein (Aβ) - the culprit destroying the brain cells, ameliorating Aβ's toxicity. "...inositol treatment for AD patients may help to prevent Aβ-deposition and Aβ-induced toxicity." conclude the authors. Thus the combination of inositol + IP6 is likely to combat this scourge more effectively than either one alone. Professor Felix Grases and his co-workers at the University of Balearic Islands, Spain, have not only found IP6 in human plasma and urine, but that the levels decreased on an IP6-deficient diet and restored quickly after taking a supplement, or after 2 weeks on an IP6-sufficient diet. Together with the numerous health benefits, these data strongly suggest that IP6 could very well be a vitamin! While Dr Philip Henneman and his colleagues at Harvard Medical School and Massachusetts General Hospital in Boston, USA back in 1958 (!) successfully used IP6 for conditions associated with kidney stone this seminal finding had largely been ignored by medical community till the mid 1990s when Professor Grases et al have shown once again that IP6 prevents kidney stone formation. Professor Grases and his collegues have also shown that IP6 prevents cardiovascular calcification. Abnormal or pathological calcification of soft tissues such as blood vessels, heart etc. can have serious consequences insofar as atherosclerosis and myocardial infarction are concerned. 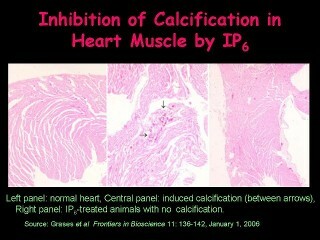 Thus, preventing pathological calcification in the body will reduce the risk of cardiovascular disease. Another critical factor in cardiovascular disease is thrombosis within the blood vessels in the heart resulting in myocardial infarction (heart attack). One of the earliest events in thrombus formation is the aggregation of platelets. 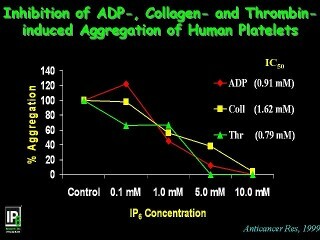 IP6 reduces the abnormal stickiness (aggregation) of platelets. During heart attack, following initial damage owing to loss of blood supply, paradoxically additional damage is done by reperfusion of the dying heart muscle by the free readicals (oxidants). In this instance too, IP6 protects the heart against reperfusion injury. Thus, IP6 may prevent cardiovascular diseases in more than one way. Androgen-independent prostate cancers are harder to treat. Dr J.S. Diallo et al from Centre de recherche du Centre hospitalier de l'Université de Montréal (CR-CHUM) and Institut du cancer de Montréal, report in the October 2008 issue of the British Journal of Cancer, that there is "[E]nhanced killing of androgen-independent prostate cancer cells when IP6 is combined with proteasome inhibitors". Please see a more recent report from these researchers and the paper by Professor Rajesh Agarwal of the University of Colorodao, Denver, USA whose laboratory has performed extensive research on IP6 and prostate cancer. Dr H.C. Tran and colleagues at the University of Maryland Biotechnology Institute and the School of Medicine in Baltimore report at the 94th Annual Meeting of the American Association for Cancer Research in Washington D.C. [July 11-14, 2003], that IP6 blocks the tumorigenesis and angiogenic potential in both AIDS/Iatrogenic-related Kaposi's sarcoma and adult T-cell lymphoma cells in vitro [Proceeding of the American Association for Cancer Research Vol 44, March 2003, pages 577-578, Abstract #2536]. Professor Giorgio Lambertenghi Deliliers and his colleagues from the University of Milan, Italy, report in the June 2002 issue of the British Journal of Haematology [vol. 117: pages 577-587] that IP6 caused a dose-dependent cytotoxicity on various human myeloid leukemia cell lines as well as on fresh chronic myeloid leukemia (CML) progenitor cells; IP6 however had no toxic effect on normal human hematopoetic cells as is commonly seen after standard chemotherapeutic agents. The authors conclude "...the spectrum of neoplasia on which IP6 has antiproliferative activity could be extended to acute and chronic myeloid leukaemias". Experiments with isolated murine pancreatic beta cells have shown that IP6 stimulates these cells to secrete insulin" [Hoy et al, Journal of Biological Chemistry Vol: 278 #37 pages 35168-35171, September 12, 2003]. And Dilworth and colleagues report that IP6 supplementation when administered in diet lowered blood glucose levels in rats. C57BL/6N mice are widely used for the investigation of the pathophysiology of impaired glucose tolerance and Type 2 diabetes to look for new therapeutics. Dr Soo Mi Kim and colleagues from the Kyungpook National University in Daegu, Republic of Korea investigated the effect of IP6 on the glucose metabolizing enzymes in these mice given a high-fat diet. They report in the July 2010 issue of the JOURNAL OF CLINICAL BIOCHEMISTRY & NUTRITION that IP6 treated mice showed a marked decrease in blood glucose level, higher glucokinase and glucose-6-phosphatase activity, higher hepatic glycogen and considerably lower body-weight than control mice. That diabetics could be benefited from IP6 + Inositol is further supported by data from Nascimento and colleagues who report in the January 3, 2006 issue of the PNAS that in their experimental model, inositol itself may work as an antioxidant and not only prevents but also reverses many of the complications of diabetes. Thus, on one hand, IP6 causes direct stimulation of insulin from pancreatic beta cells and inositol on the other hand helps in the prevention of complications of diabetes; combination of IP6 + Inositol gives dual benefits. Radiation is energy distributed across the electromagnetic spectrum. Approximately 80% of all radiation encountered normally by mammals is from naturally-occurring sources. Radiation, particularly ionizing radiation, has an adverse effect on cells and tissues, primarily through cytotoxic effects. In humans, exposure to ionizing radiation occurs primarily through therapeutic techniques such as anticancer radiotherapy, through occupational and/or environmental exposure to human-derived radiation sources, or through occupational exposure to naturally-occurring radiation sources as in the case of aircraft flight personnel. And of course there is always the potential of war-time, accidental or terrorist-induced nuclear blast. One of the chronic or late effects of radiation-damage is cancer; the common non-melanoma skin cancer from sun-exposure is attributed to UV radiation. A report in the journal Radiation Protection Dosimetry (2007) by Dr D. Cebrian and colleagues from the Radiobiology Laboratory of the Department of Environment, CIEMAT, Madrid, Spain, show "strong affinity of inositol hexaphosphate (IP6) for uranium, suggesting that it could be an effective chelating agent for uranium in vivo." The 2007 Centennial Meeting of The American Association for Cancer Research on Translational Medicine was held in Singapore 4-8 November 2007. A paper presented by Professor Shamsuddin and colleagues showed that IP6 and inositol protect human cells against radiation damage in the laboratory (in vitro) in various ways. For example while irradiation caused increased cell death (loss of cell attachment, apoptosis and necrosis) IP6 and inositol treatment prevented cell death, in vitro. 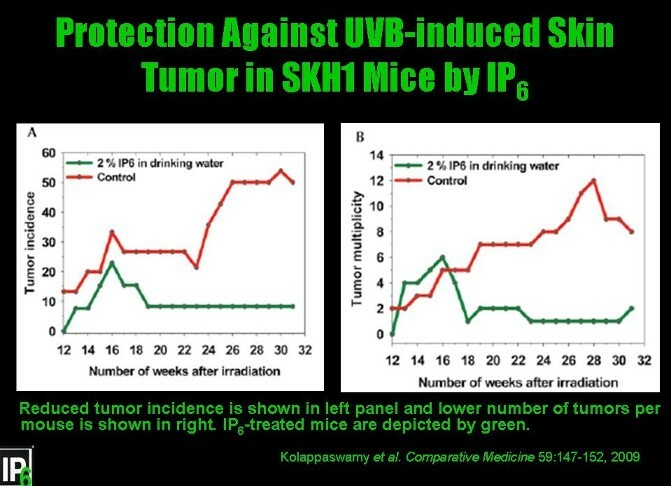 In vivo (in laboratory mice) IP6 significantly reduced the incidence and multiplicity of UV-induced skin tumors in mice. Using human immortalized keratinocyte HaCaT cells Williams et al (2011) also show the effectiveness of IP6 in an in vitro model. These data therefore suggest that IP6 + inositol could help protect us from various forms of radiation damage such as UV from sun-exposure, radiation therapy, cosmic radiation, accidental or induced nuclear blasts etc. DISCLAIMER: This Web site contains research information on IP6 and Inositol; the contents herein are not to be considered as medical advice for which you should consult your health-care provider(s). 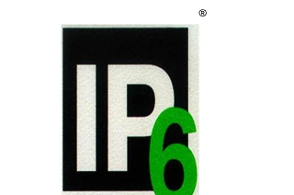 IP-6 Research, Inc., does not assume any responsibility whatsoever for your use of this Web site or the information contained herein.